Went to her new home on Sunday 30th March 2014. 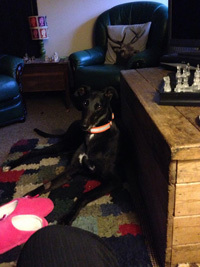 Lucy is a lovely black ex-racing greyhound who is Fleck's sister. She was born on the 20th August 2008 and weighs 26.8k. She is a quiet and very placid girl. 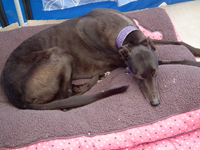 She travels well in the car, is easy to walk on the lead and can be playful at times. 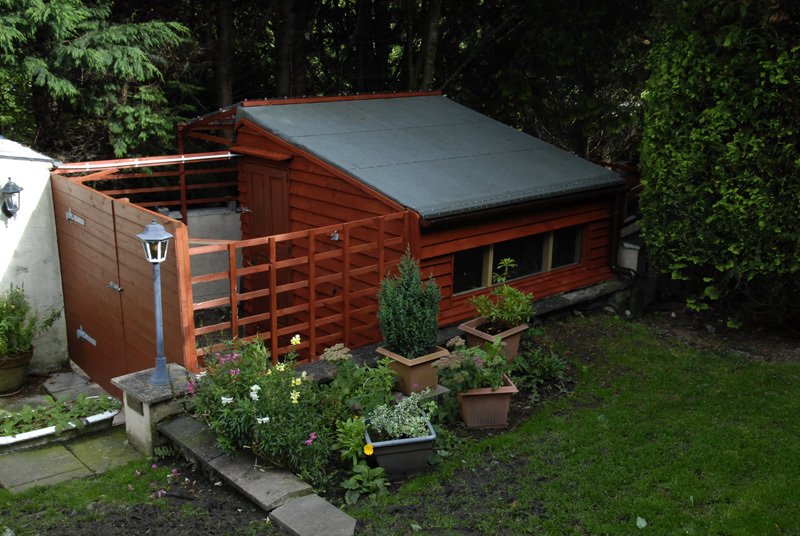 * The branch kennel at the bottom of our garden is where Lucy and the other resident(s) will be for the first day or so until he gets to know the other greyhounds. He has use of our garden and paddock, and once he gets to know the other dogs he will be allowed in the house during the day and all the dogs will then take it in turn to sleep in the house at night, so they become use to sleeping in both the kennel and the house. Tillie and Lucy both arrived this afternoon, and after a wander around the garden we put them both in the kennel to settle after their jouney. This morning we flead and wormed Lucy as is normal with new dogs arriving. This morning Lucy took a trip to the vet where she was spayed and received her first inoculation because she came with no inoculation card. All went well with the spaying and we collected her in the late afternoon. She had developed 'the runs' while in the vets, so they gave us some Promax to put on her food for the next couple of days or so. She was fine before she went in so we think it may have been stress. Coming home in the van she did more so we gave her a wash before putting her in the kennel, which we'd made warmer than normal for her. With her having the 'runs' we shut her in the kennel section so as not to spread it everywhere if she did more in the night. I think Lucy felt somewhat weary and very sore because it took her ages before she lay down and didn't want me to help her. When she eventually settled herself she went to sleep to sleep off the aneasthetic. Lucy had no accidents during the night, but she was still very loose this morning when we let her out, so she will be having more Promax this evening with her dinner. She ate her breakfast and was more back to her normal self by lunch time. This afternoon when Nigel came to walk the dogs he gave Indi, Tillie and Lucy a short and gentle walk, which they enjoyed. 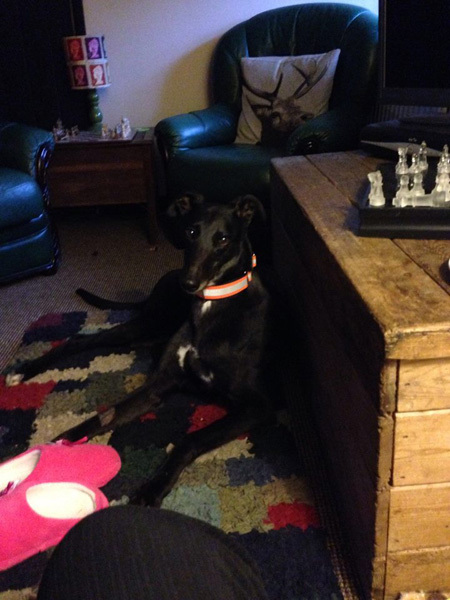 Wendy who is fostering Lucy until she goes to her forever home says she is 'getting on grand' and settling in well to the home environment. This morning Stuart drove Lucy north to meet her new owners half way from their home and place of work. She travelled well in the van, and having greeted her new owners jumped in the back of their vehicle and off she went to her new home where we hope she will have a long and happy life with her new family. We heard today that Lucy is settling in nicely.